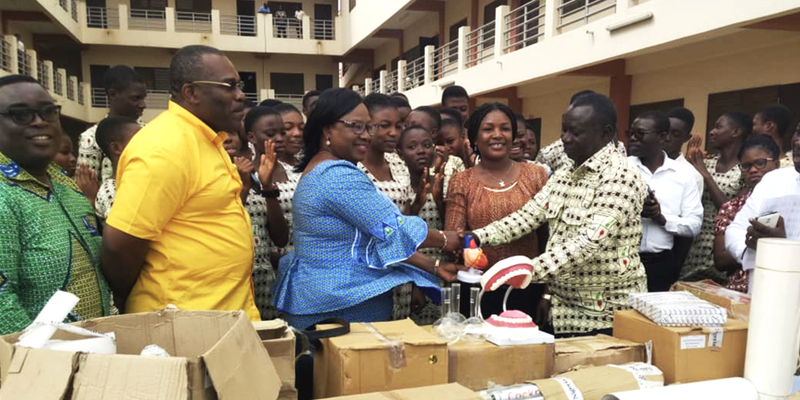 The Volta River Authority has donated science laboratory equipment valued at Twenty-five Thousand, One Hundred and Five Ghana Cedis (GH₵ 25,105.00) to the Kpone Community Senior High School. The donation, though a Corporate Social Responsibility, also forms part of Management’s strategy of extending its environmental footprint and adding value to the lives of the residents in the impacted communities. Presenting the items, Director, General Services, Ms. Shirley Seidu, expressed the hope that the equipment would facilitate the teaching and learning of science in the school. She urged the students to study hard to become responsible citizens. Receiving the items, Headmaster of the school, Mr. Wiafe Akenten, thanked VRA for their commendable support and assured that proper care of the items will be taken. He proposed the naming of the Schools Physics Science laboratory after VRA, considering the Authority’s tremendous support to the school. He recounted how, VRA has invested immensely in community development projects in the areas of education, social and economic empowerment. Items donated included chest freezer, round bottom flask, retort stand and clamp, acids, liquid detergent, disposable gloves, periodic table, pipette, burette, etc. Present at the event was Manager CSR, Mr. Sam Fletcher, Plant Manager TTPC, Ing. Edward Obeng Kenzo and Information Publicity Officers, Mr. Lawrence Quartey and John Chobbah.